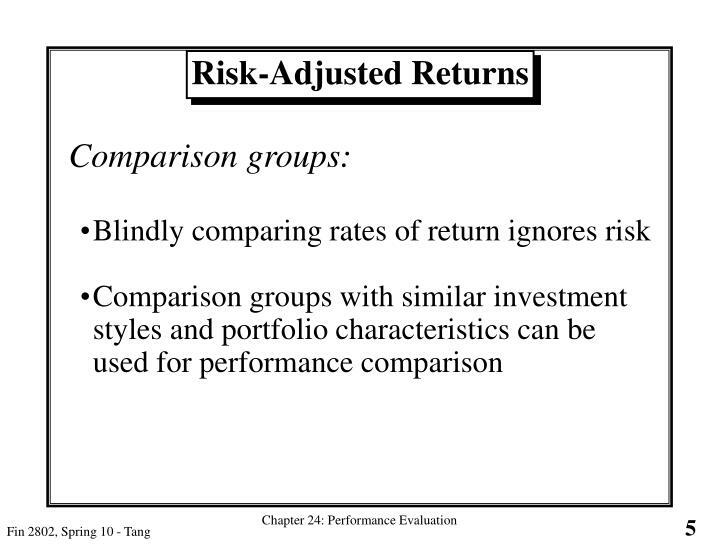 Compute risk-adjusted rates of return. 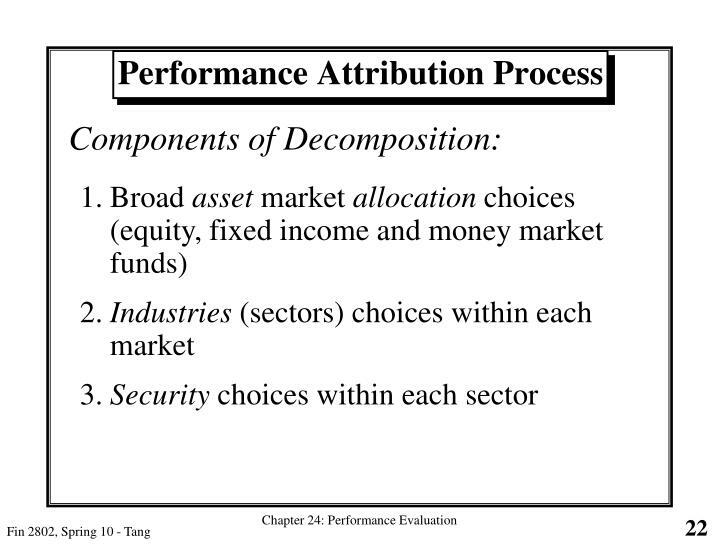 Decompose excess returns into components attributable to asset allocation choices versus security selection choices. 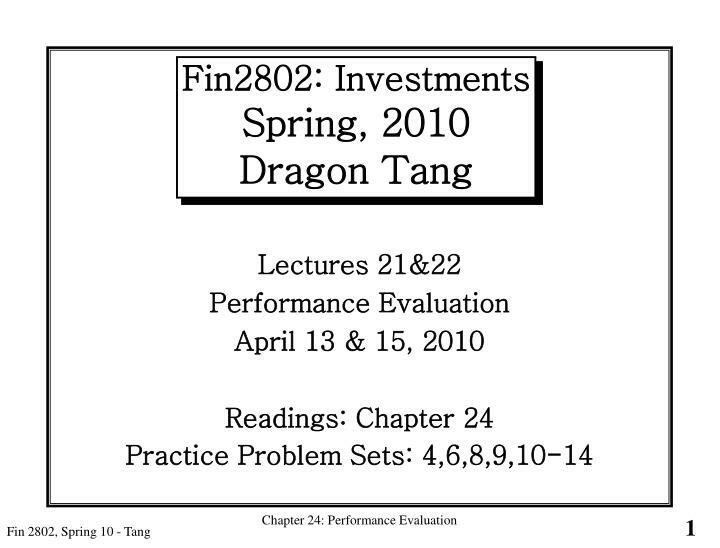 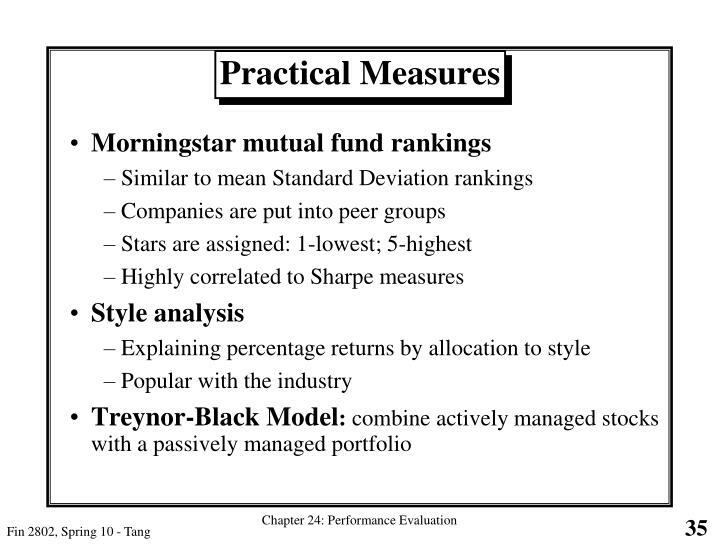 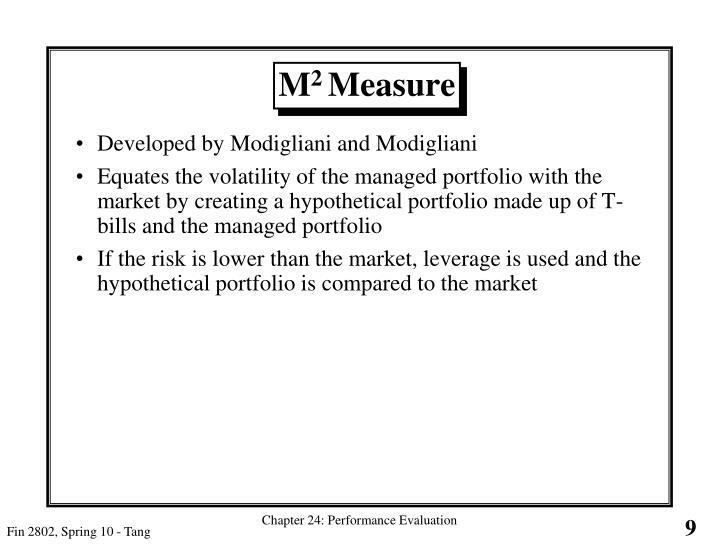 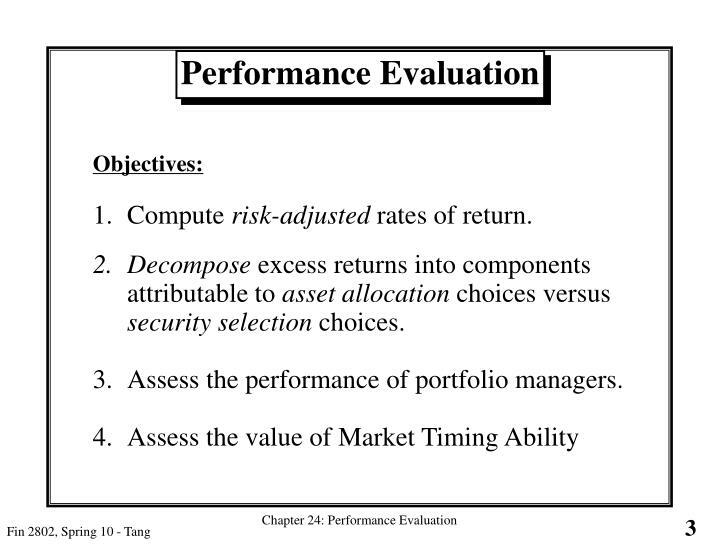 Assess the performance of portfolio managers. 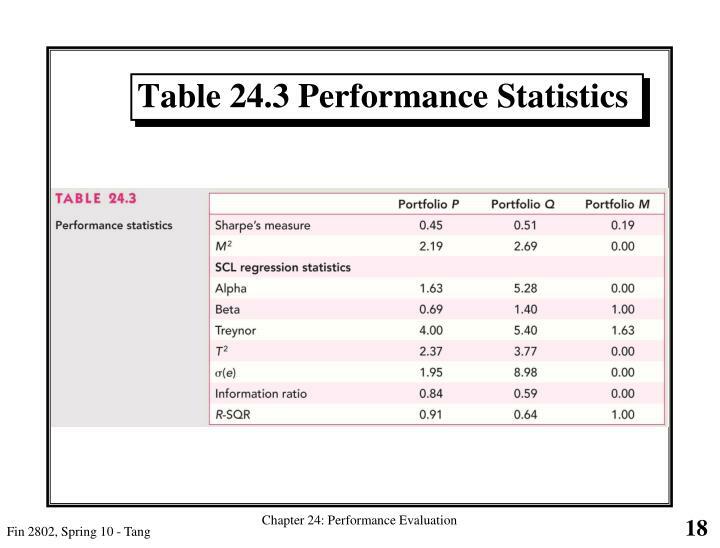 Goal of performance evaluation is to distinguish skill (and specific components) from luck! 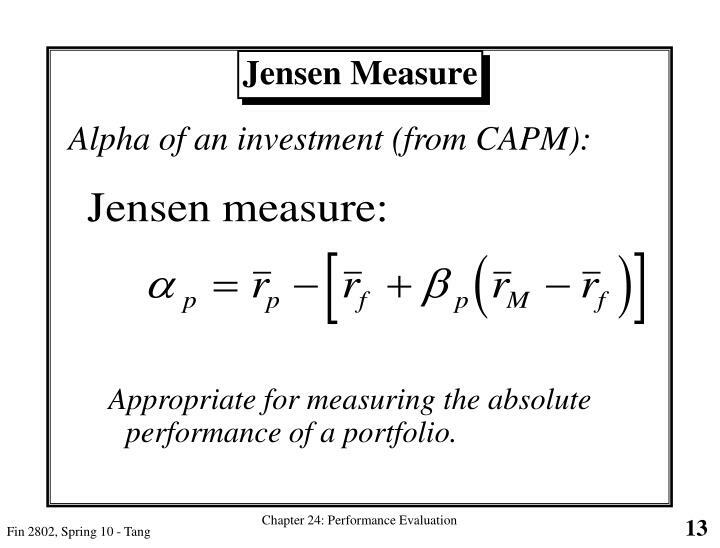 Appropriate for measuring the relative performance of an entire portfolio. 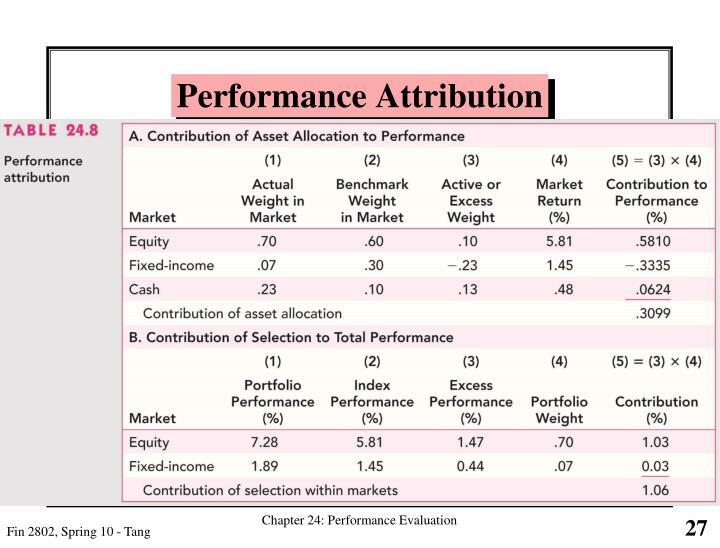 Appropriate for measuring the relative performance of parts of a portfolio. 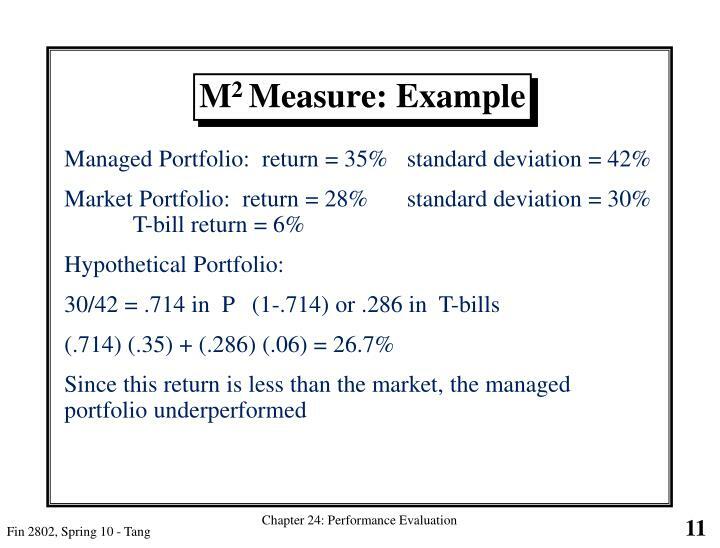 Appropriate for measuring the absolute performance of a portfolio. 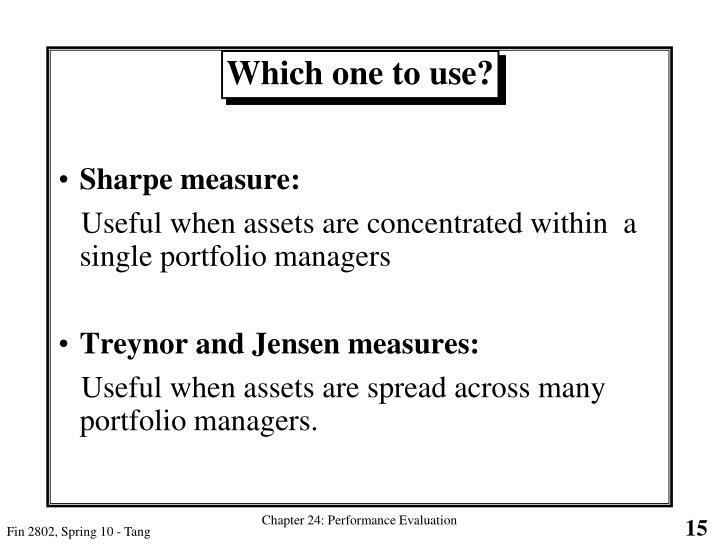 Useful when assets are spread across many portfolio managers. 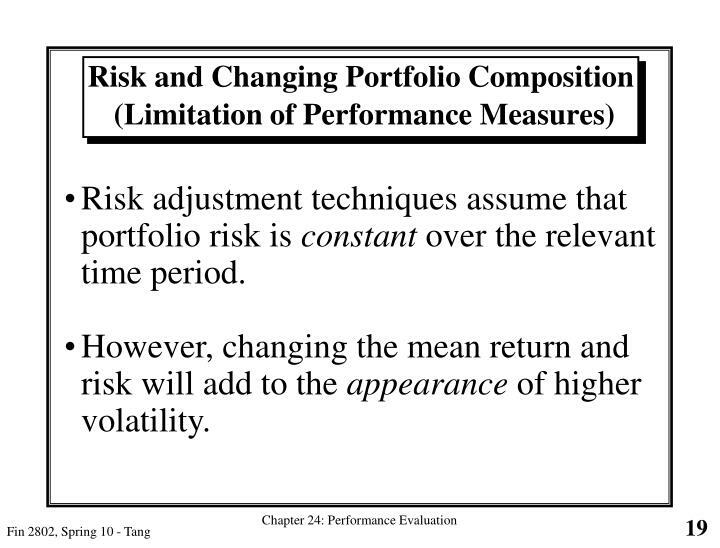 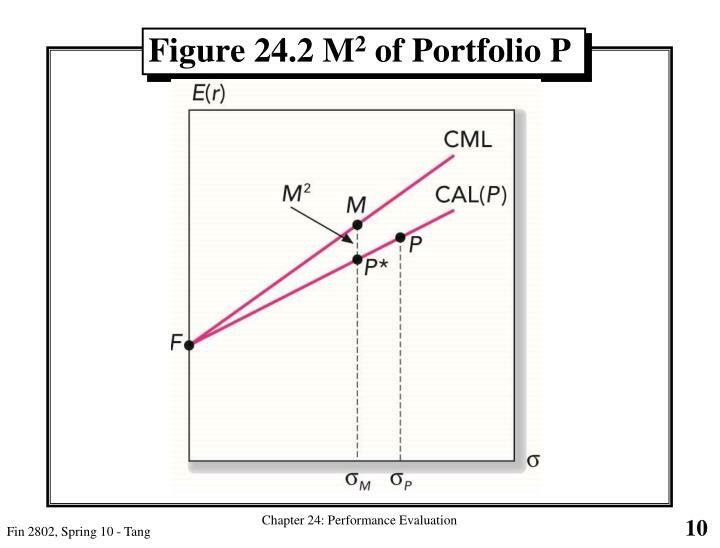 Risk adjustment techniques assume that portfolio risk is constant over the relevant time period. 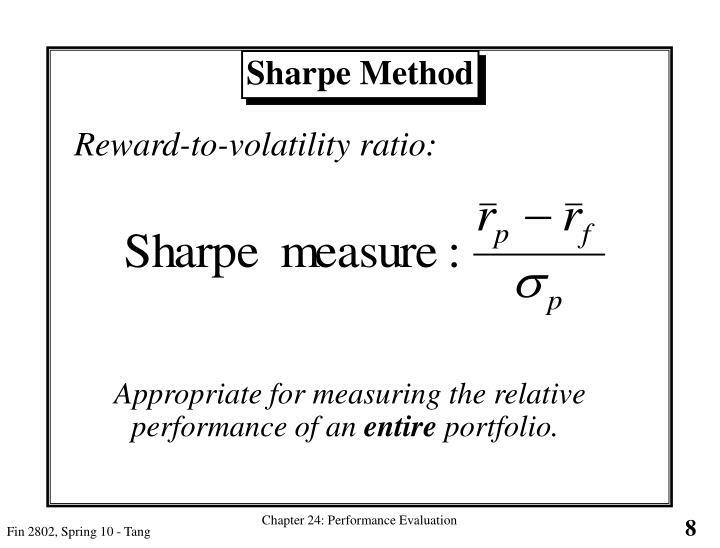 However, changing the mean return and risk will add to the appearance of higher volatility. 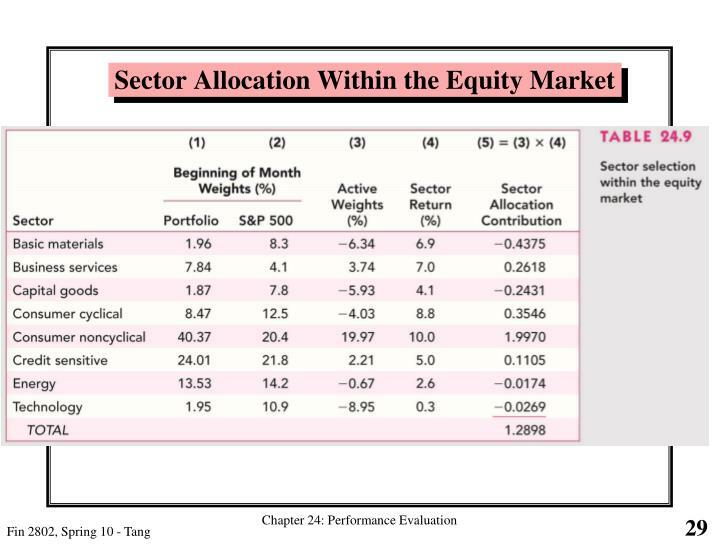 If the portfolio manager can time the market, she would shift funds from the safe asset to the market portfolio (from cash to stocks or bonds) just before the market upturn. 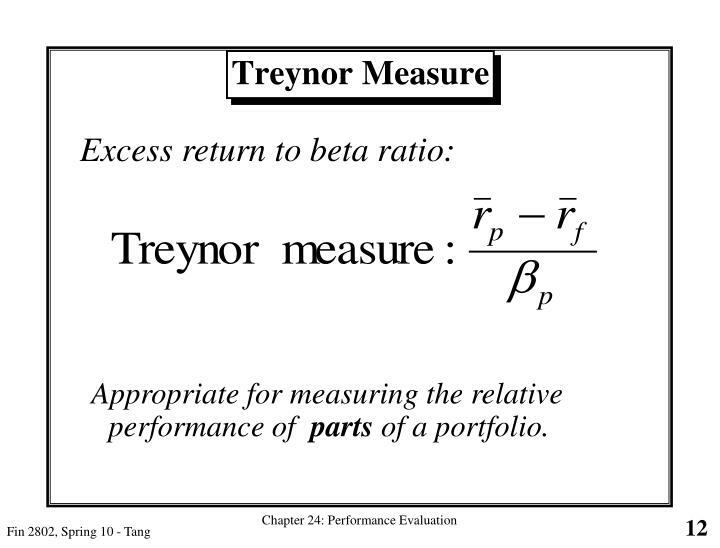 This would increase the portfolio beta. 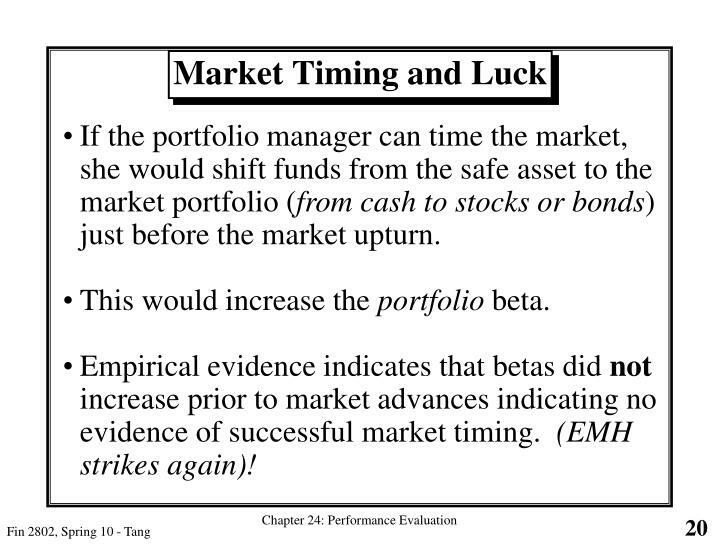 Empirical evidence indicates that betas did not increase prior to market advances indicating no evidence of successful market timing. 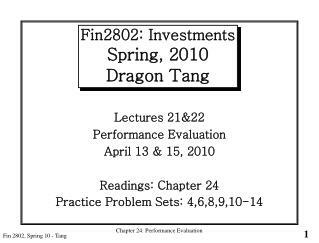 (EMH strikes again)! 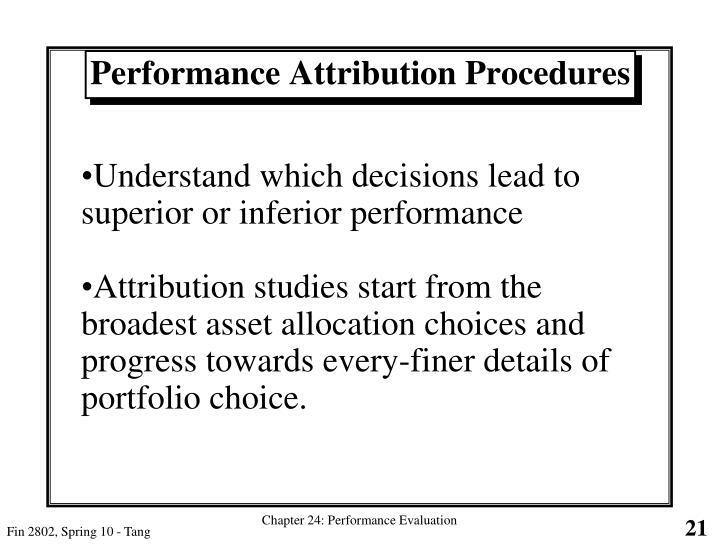 Attribution studies start from the broadest asset allocation choices and progress towards every-finer details of portfolio choice. 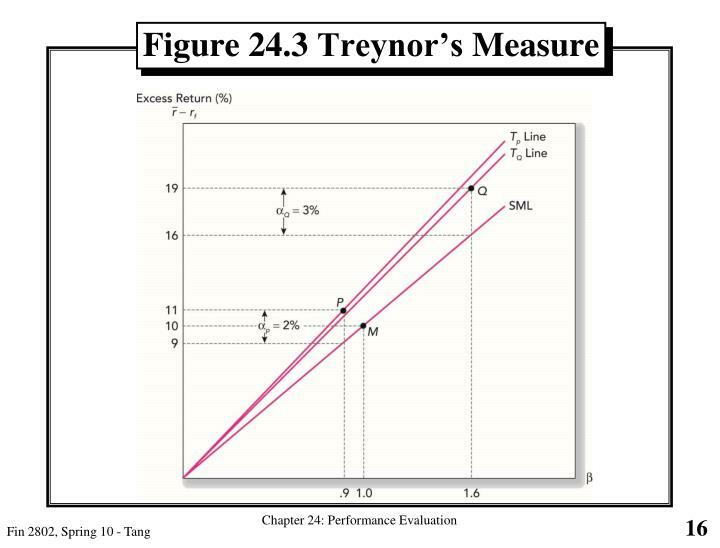 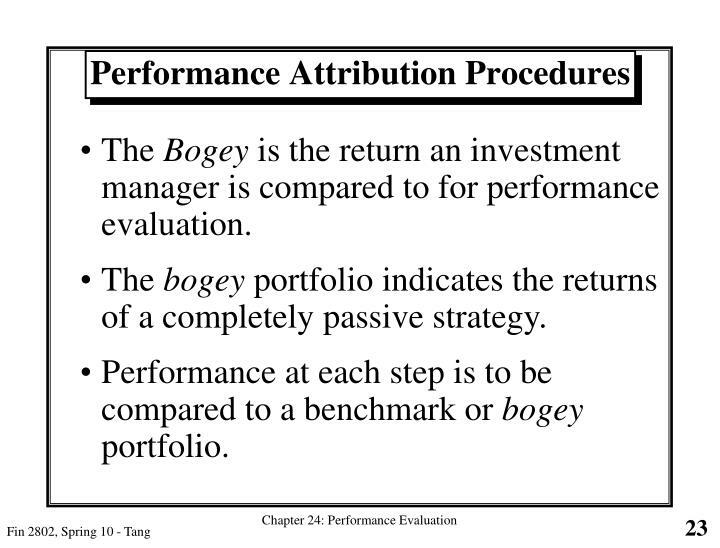 The Bogey is the return an investment manager is compared to for performance evaluation. 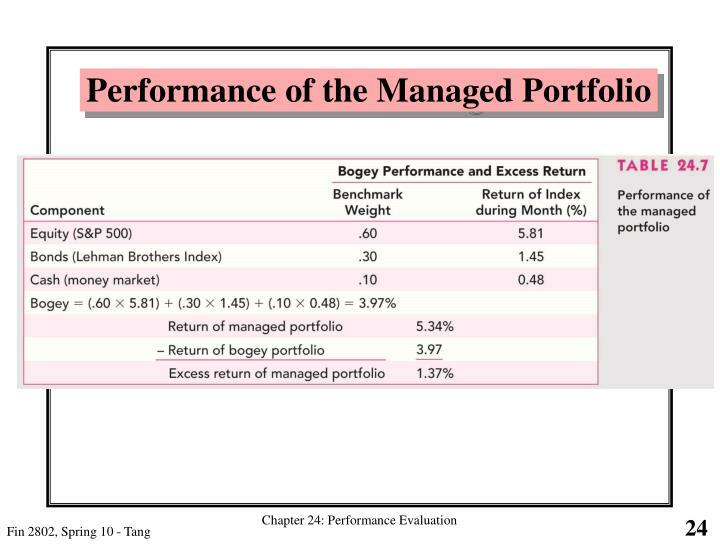 The bogey portfolio indicates the returns of a completely passive strategy. 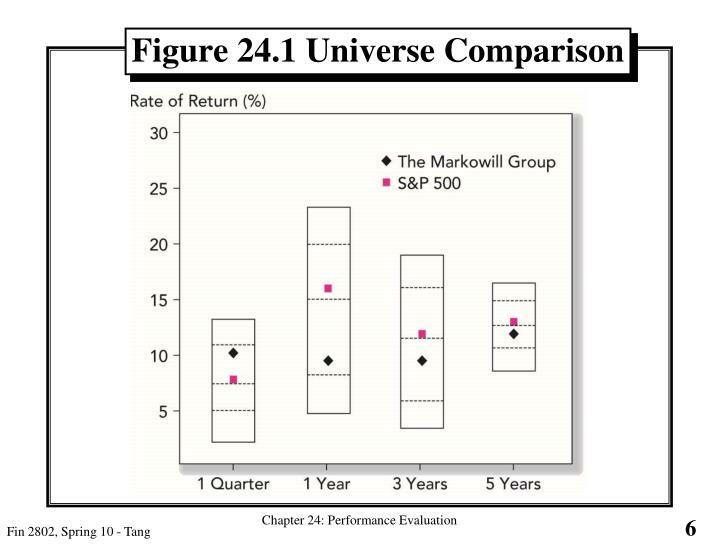 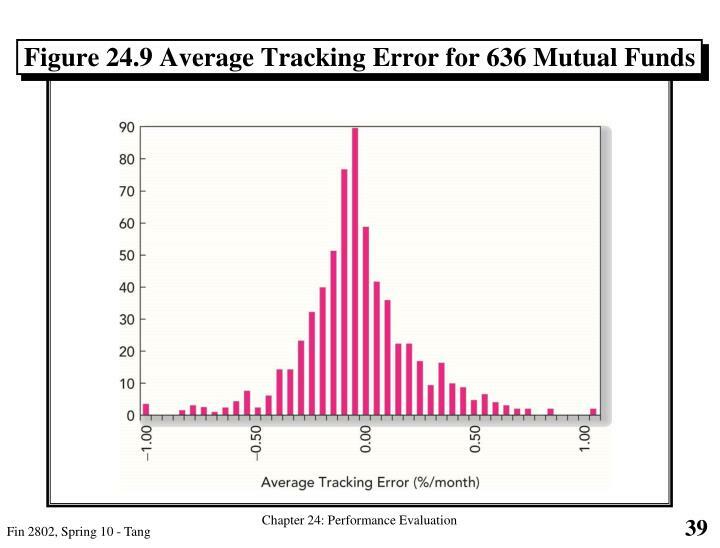 Performance at each step is to be compared to a benchmark or bogey portfolio. 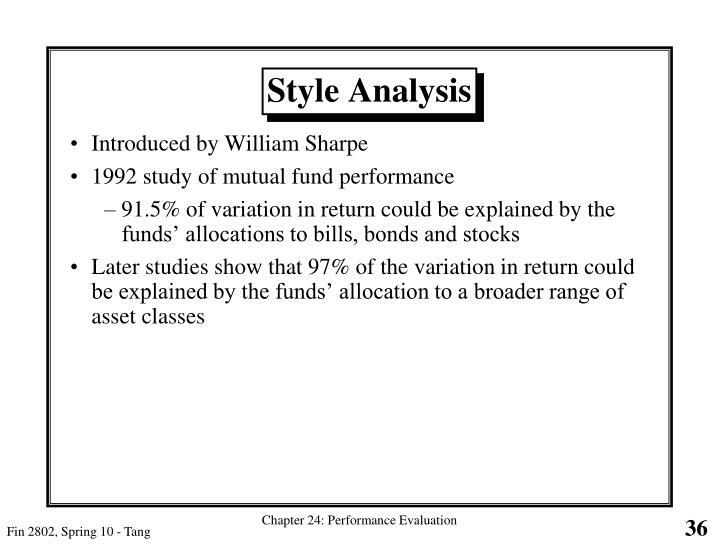 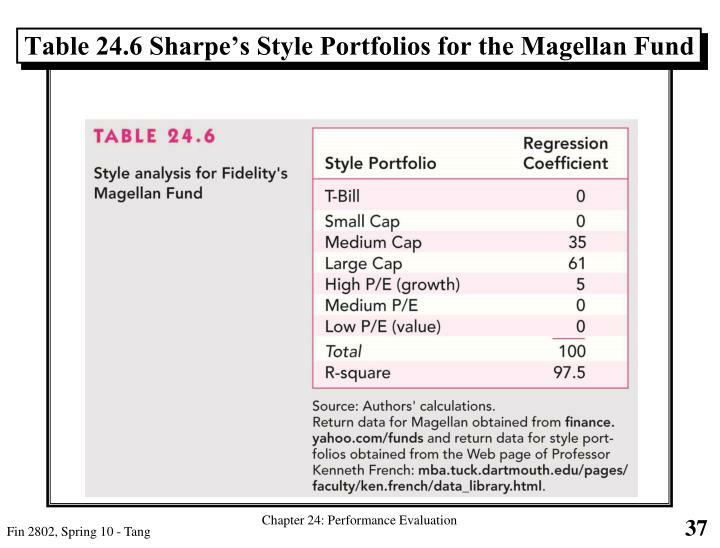 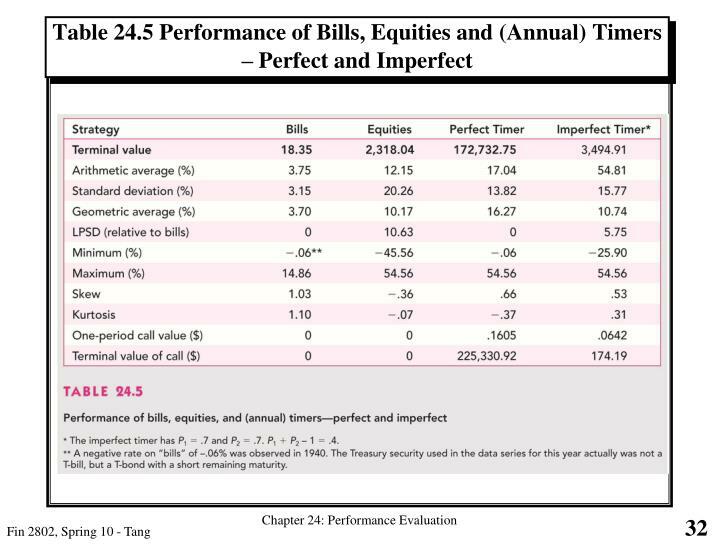 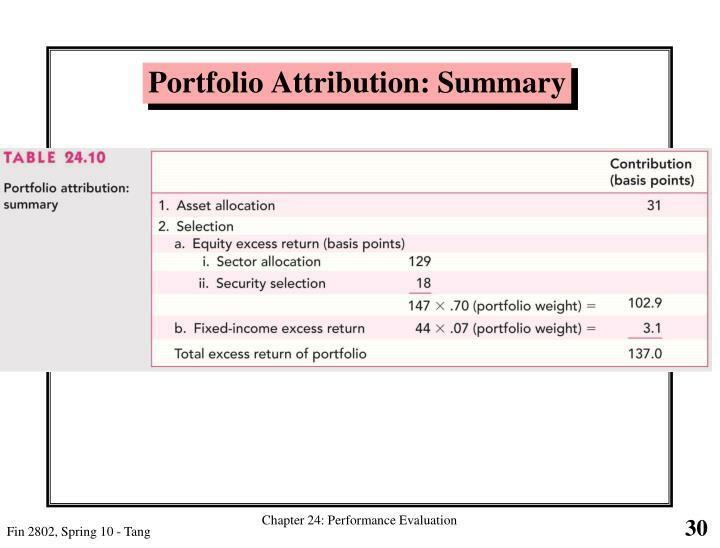 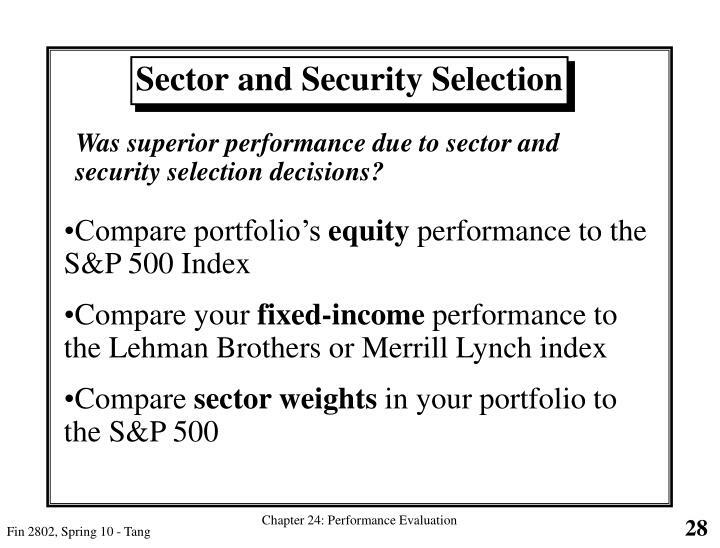 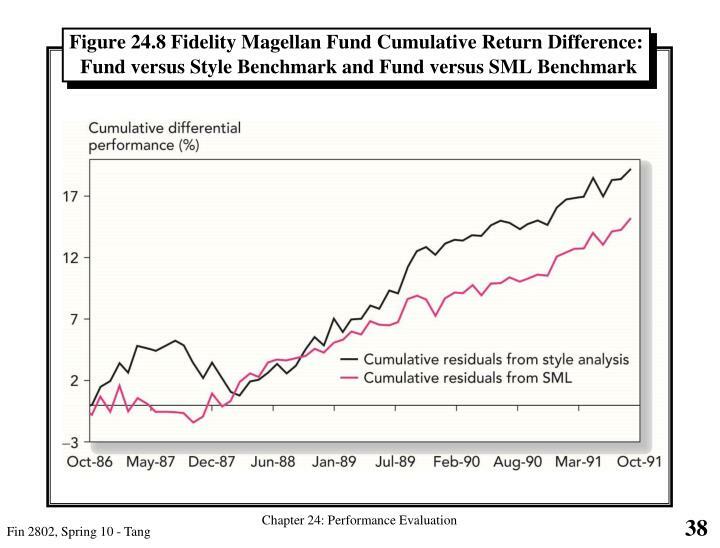 Was superior performance due to asset allocation? 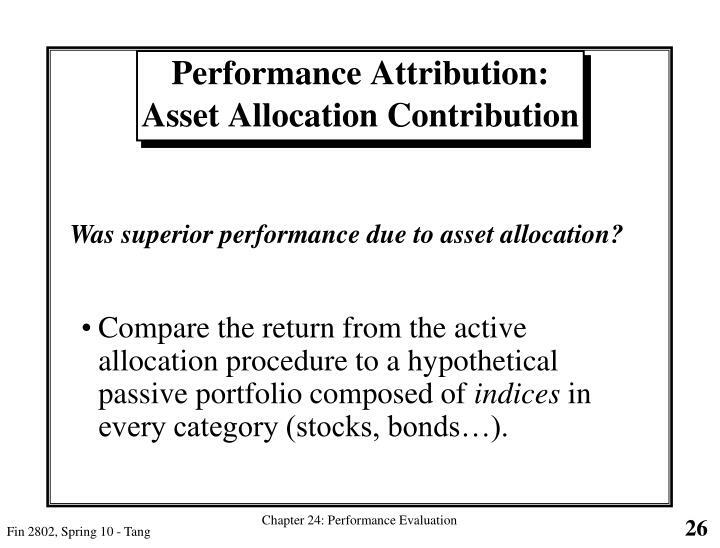 Compare the return from the active allocation procedure to a hypothetical passive portfolio composed of indices in every category (stocks, bonds…). 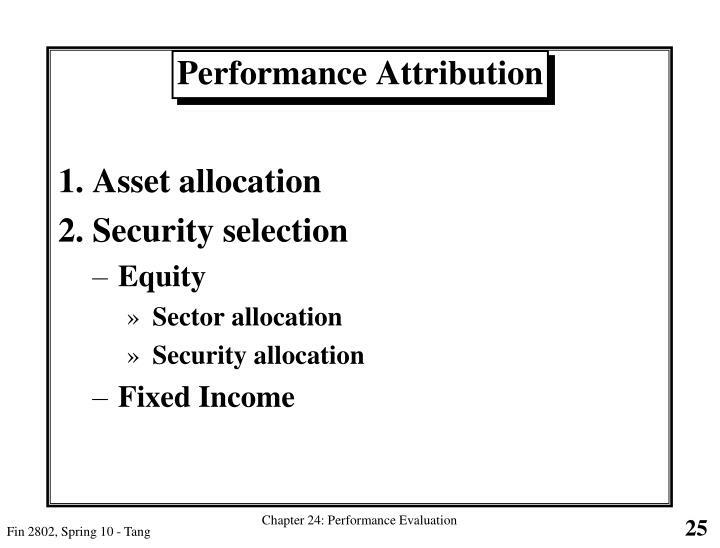 Asset Allocation in which investment in the market is increased when the market is expected to outperform T-bills. 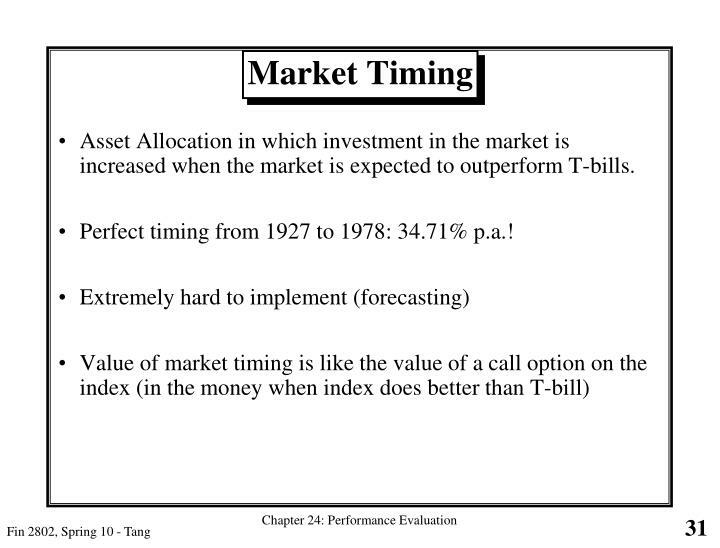 Perfect timing from 1927 to 1978: 34.71% p.a.! 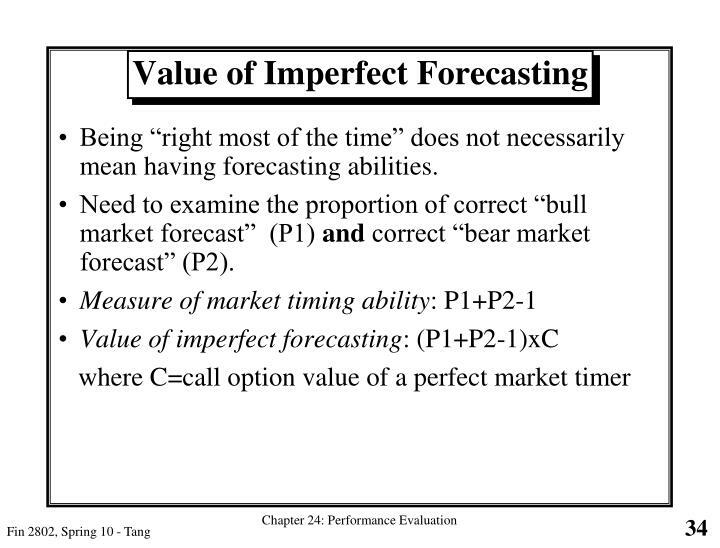 Being “right most of the time” does not necessarily mean having forecasting abilities. 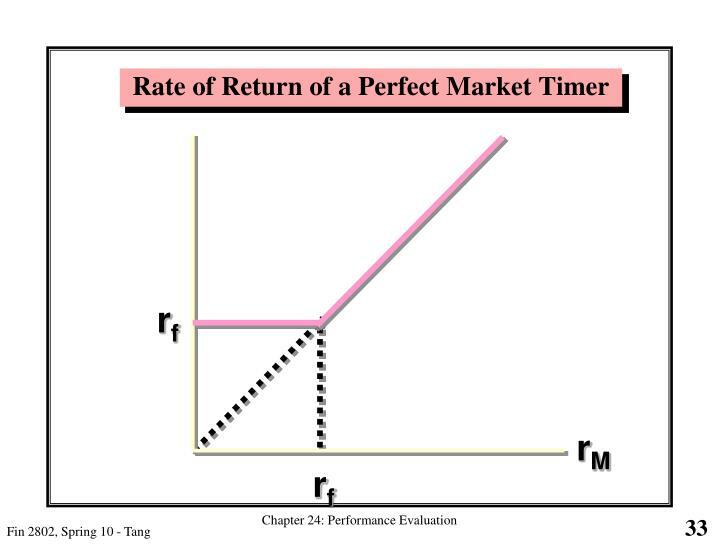 Need to examine the proportion of correct “bull market forecast” (P1) and correct “bear market forecast” (P2). 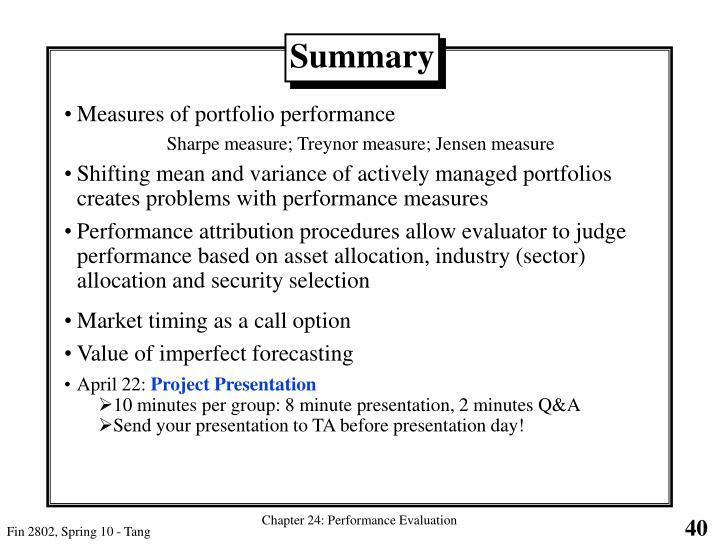 Send your presentation to TA before presentation day! 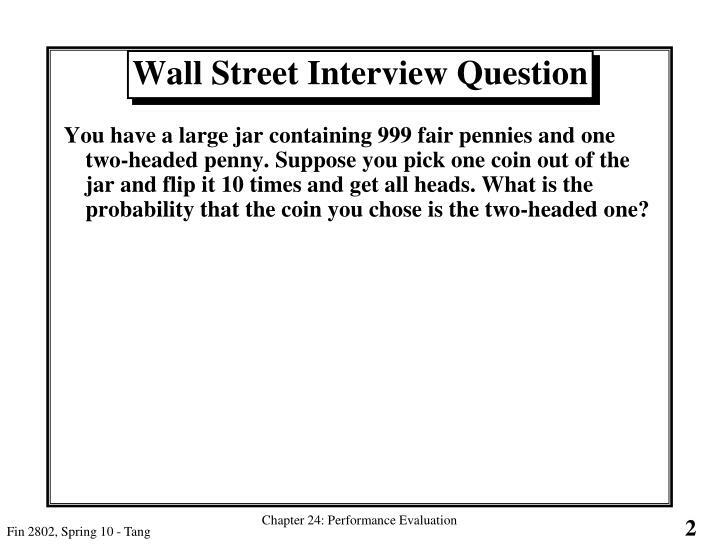 SWV 2802 -. 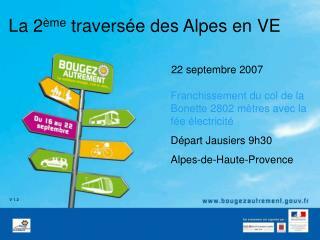 bijeenkomst 26 november johan frisoschool lansingerland. 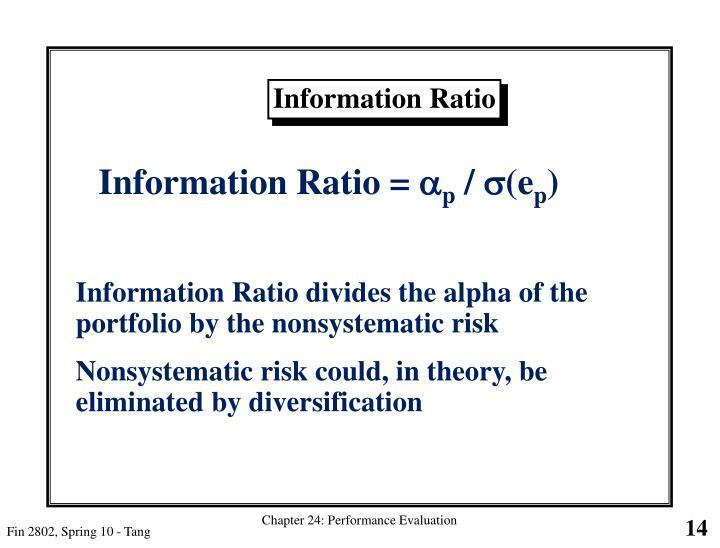 stand van zaken. wat is er na 5 juni 2012 gebeurd? 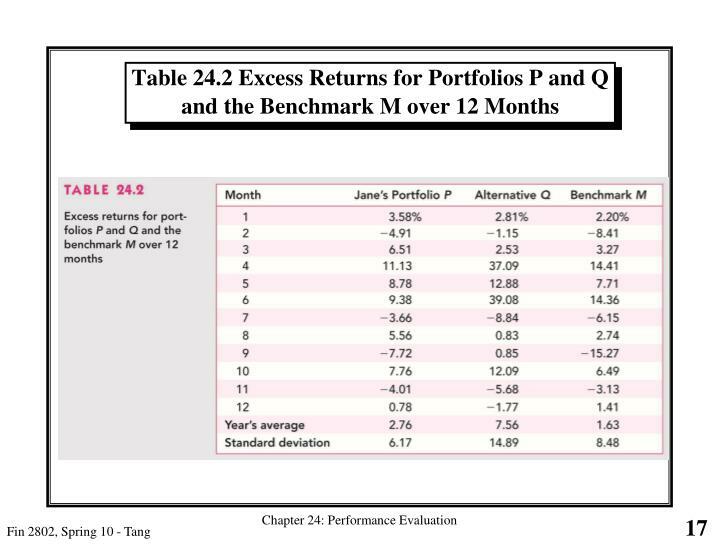 werkgroepen juni – september 2012. hoofdlijnennotitie 0.4 najaarsconferentie 1 november 2012. hoofdlijnennotitie.